Asean is the world’s sixth-largest economy with a GDP of more than $2.5 trillion and an annual growth rate of around 5 percent. Sustaining this growth requires the region to meet its growing infrastructure needs which China’s Belt and Road Initiative could help fund. But as Phidel Vineles points out there are hurdles that threaten to disrupt the smooth implementation of BRI projects in the region. China’s ambitious Belt and Road Initiative (BRI) continues to draw criticism and disapproval. Its sceptics brand it as China’s Marshall Plan or as a ‘neo-imperial project’. To ensure the initiative’s success, China should heed some of these concerns and take steps to improve the implementation of BRI-related projects. Doing so is particularly important in Asean – a region that stands to greatly benefit from BRI investment, if done right. Asean is the world’s sixth-largest economy with a total GDP of more than $2.5 trillion. Economies across the region are growing steadily at an average annual rate of around 5 per cent. Sustaining this growth requires the region to meet its growing infrastructure needs, which are estimated to amount to $2.8 trillion from 2016 to 2030. China’s BRI is important for Asean because it can help to fund and meet the region’s infrastructure needs. It also supports the success of the Asean Community Vision 2025 and Master Plan on Asean Connectivity 2025 initiatives. A major BRI–Asean project is the Pan-Asia Railway Network designed to connect China with Southeast Asia. Its three main railway routes – the eastern, central and western routes – all begin in Kunming, China. The eastern route has a total estimated cost of $600 million and will pass through Vietnam and Cambodia into Thailand. The central route will pass through Laos, Thailand and Malaysia into Singapore. As a high-speed railway project, it is the most expensive route with an estimated cost of more than $33 billion. The western route will pass through Myanmar into Thailand and is estimated to cost $2 billion. Other BRI-related projects aim to boost Asean’s digital economy as China takes steps towards realising its vision for a Digital Silk Road. 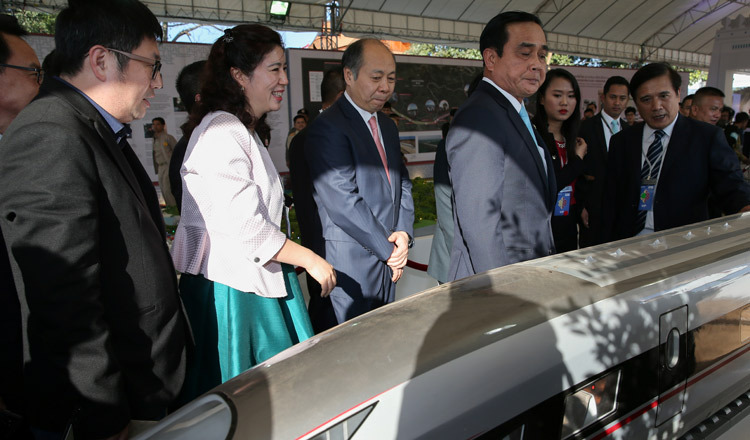 Thailand’s Eastern Economic Corridor, which includes a Smart Digital Hub to optimise cross-border China–Asean flows, has attracted $5 billion from China’s HNA Innovation Finance. Elsewhere, Malaysia is partnering with Chinese conglomerate Alibaba to develop the country’s Digital Free Trade Zone. But there are hurdles that threaten to disrupt the smooth implementation of BRI projects in the region. In particular the initiative is criticised for its lack of transparency and inclusivity, which contradicts China’s BRI rhetoric of a ‘common destiny’ and ‘shared interests’. ➡Eighty-nine per cent of all contractors participating in BRI projects are Chinese companies. This is unlike projects funded by the World Bank and Asian Development Bank where 40.8 per cent are local, 29 per cent are Chinese and 30.2 per cent are foreign. The lack of local involvement is attracting criticism. For example, a BRI rail project in Laos is receiving complaints from locals that the project’s labourers are mainly Chinese. Another worry is that BRI projects will expose partner countries to “debt traps”. This perception was amplified in late 2017 when Sri Lanka handed over the management of its Hambantota Port to a Chinese company after struggling to repay its debt. These concerns are inducing some Asean member states to renegotiate their investment agreements with China. In Malaysia, Prime Minister Mahathir Mohamad is pushing to lower the costs of BRI-related infrastructure projects. In the meantime, the Malaysian government has ceased work on some Chinese-funded projects, including the East Coast Rail Link and two gas pipelines. Similarly, Myanmar’s Planning and Finance Minister Soe Win wants to reduce the scale of a China-led special economic zone project in the western state of Rakhine because of overinvestment concerns. To make the BRI a success, Asean and China should consider implementing a coordination mechanism through the Asean Connectivity Coordinating Committee and the Chinese Working Committee of the China–Asean Connectivity Cooperation Committee to assess the viability and risks of BRI projects. This would help to avoid project cancellations or delays due to uncertain political and economic conditions. It would also help to prevent BRI participants from becoming exposed to debt traps. The BRI should also strengthen its people-to-people connectivity through human capital development. Equipping local labour forces with the skills needed to work on BRI-related infrastructure projects would result in job creation for locals and could make the BRI more attractive for Asean member states. Cooperation between local, Chinese and other foreign companies must be promoted to better implement China’s rhetoric about openness and inclusivity. If Chinese firms enter joint ventures with their local counterparts, construction activities would be completed more efficiently because local firms have more experience in handling operational challenges in their own country. Involving foreign companies would also create opportunities to acquire international standards in infrastructure quality. Asean is an important partner and linkage point for China’s BRI. Faced with growing backlash, it is time for China to implement policy measures that can reassure Asean member states that the sceptics have it wrong. How Balochistan can develop Sustainably?